Do loud restaurants leave you with reservations about eating out with hearing loss? Eating out with friends and family is one of life’s great pleasures. The food, the drinks, the service, the fact that no one has to do the dishes? It’s all part of the package. But the best part is the time spent with those we love, laughing and talking while enjoying food that someone else made, and made better. Yet with hearing loss, challenges can come from eating out. While the rest of your dining companions are enjoying themselves, you may be struggling to endure the experience, wishing you could just leave and sit in your nice quiet car with a doggie bag and a spork. What makes dining out so difficult, even with hearing aids? Quite simply, it’s the noise! Many popular eating establishments have background noise that nears the point of creating ear damage. Obviously, this makes conversation nearly impossible, even if you don’t have hearing loss. What causes all this racket? First, there’s the music, which is often not mere background noise, but very much front and center. Open kitchens are another enemy of meaningful restaurant conversations. While a fun concept, in theory, an open kitchen means that pot clanging and order-barking is conducted for all patrons to hear. These factors, together with bad acoustics, an adjacent bar, and a crowded dining room, make it almost impossible for people with normal hearing to understand each other without shouting, let alone those with hearing loss. What can you do if you love to eat out, but you also think yelling to converse is not part of a good dining experience? Here are some tips from Julia Tanner, audiologist at The Hearing Solution in Sacramento. Read restaurant reviews carefully. Here in Sacramento, we have superior restaurant reviews in The Sacramento Bee. They are thorough, often mentioning the noise levels at an eatery. For example, reporter Carla Meyer recently mentioned a noisy feature of a new restaurant near The Golden One arena. Other negative reviews in The Bee have prompted restaurants to call in acoustic experts to help bring the noise levels down. Eat during off-peak hours. While it’s fun to hit a place when it is hopping and everyone who is anyone is there, shouting to be heard is exhausting. If you’ve enjoyed the food and service at a place on a Saturday evening, but left with your ears buzzing, try a less crowded time or day. Better yet, pop in for lunch and enjoy the same food, with easy conversation, and for less money. Ask to be seated in a quieter area of the dining room. Don’t be shy, tell them why! Explain that you have hearing issues. If they can’t respect that, do you even want to eat there? Even a noisy establishment with an open kitchen, tile floors and people screaming to be heard may have a quiet and calm vibe in their outside patio dining. Kindly ask if the music can be turned down. The servers and wait staff may have no control over this decision, but it doesn’t hurt to ask. If they comply, they just made a return customer. And if your request is granted, be sure to thank them personally and when leaving their tip. Walk out. If you arrive at a hot new place you’ve heard great things about, but you’re yelling just to be heard in the foyer, things will probably not improve once you’re surrounded by tables full of other people also yelling to be heard. If you can’t enjoy your evening at one place, it’s better to find another restaurant. 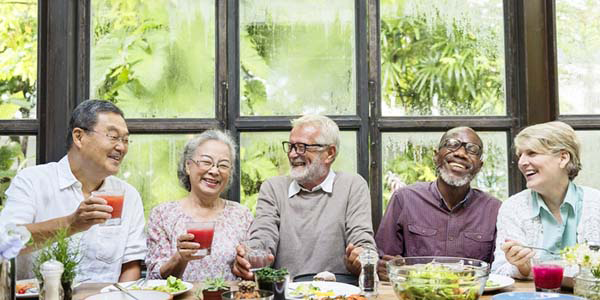 Hearing loss can be a challenge in the best of circumstances, but dining out can make you want to throw in the cloth napkin and call it quits. This experience is not unique. Many restaurants are addressing these issues, because the worst sound to an owner is an empty dining area. The growing number of baby boomers with hearing issues means that some adjustments need to be made. Let your voice be heard over the din of the clanking pots, blaring “background” music and reverberating tile floors! The understanding staff at The Hearing Solution is anxious to hear your concerns and challenges when it comes to eating out. It’s possible that your hearing aids just need some minor adjustments, fine-tuning them to fit with your social life. If you don’t have one already, a remote volume adjuster for your hearing devices gives you the power of control in public places with high noise levels. Stop by our serene and quiet office in Sacramento and we can talk about your hearing needs. You are also invited to give us a call or make an appointment online. After your hearing assessment and adjustment is finished, you can celebrate by getting a bite to eat. We know a lot of great places, nice and quiet.